Background and orientation are up to you. Please include a hidden Barney if possible. Well, Wolverine is about to be really pissed in a couple of seconds. That is some excellent looking rubble, btw. Wow. I love it !!!! There's so much fun in there, it's something the commissionner will always smile at. Congratulations to the commissionner ! Good grief, I love this idea! If that were on my wall, I would smile every single time I walked by it. seeing her with the upper hand....for the moment. Sometimes I think back on the earliest days of my career, and even earlier, remembering that I used to wonder if I might someday be "known" for some particular aspect of my art, and if I was, what it might be. Would it be Hot Babes? Would it be Wild Tech? Would it be Cool Costumes? Didn't even occur to me that high on the list might be Big Piles of Broken Stuff! I really like that! Well Done. That is truly fun. Love how Harley retains the energy of animation while still being drawn in your style. That is hilarious! Thank you, JB, and thank you to whomever requested this twisted piece of awesomeness! She don't know him very well, do she? Sweet piece, thanks for sharing! Really like Harley's left eye and tongue. My son does a lot of stuff with his tongue sticking out, so that brought a big smile. I found Barney in the Rubble! Would it be Wild Tech? JB, the correct term is "Byrne-Tech" ;-) For cool tech, there's you, Perez, and Kirby. Another great image. I would say another thing JB is known for is his ability to convey that Wolverine is a hunter with body language. I see lots of images that never expose that Logan is feral and hunts. Great fun. I like how Harley is lining up her shot. I love that Harley Quinn has choked up so far on the club that she'll probably hit herself even as she barely taps Wolverine! Great piece. About time we got a Harley commission. I was even thinking about why we haven't seen her in commissions. Maybe not the BEST idea-- but damn close to it! I LOVE this commission. Wolverine's intensity sets off the rest beautifully. Here's an idea that reaches a kind of full expression in the commission. I mean, I can easily imagine the story going forward-- but the single image says so much that I feel like this encounter really has happened-- more actual artwork is not necessary. Great stuff! While trying to find Barney, I noticed the bottom-most right stripe on Wolverine's uniform isn't filled in. Still haven't found Barney, tho. 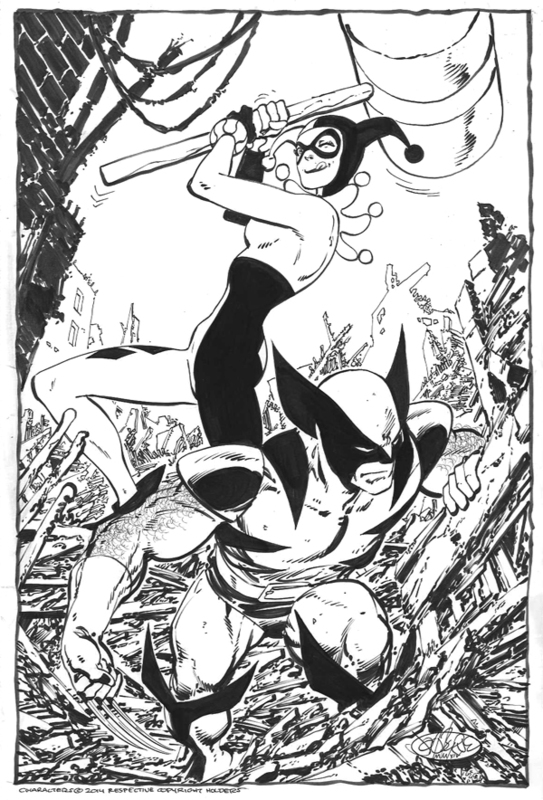 I love Harley, Logan is going to have a big headache in a moment. I found the Barney.